If growing up in New England has taught me one thing, it’s that I will always work in the seafood industry. My earliest childhood memories consist of living in Cape Elizabeth, Maine, where we would go to the local lobster shack and eat fried baby Maine shrimp. On weekends, my family and I would head into downtown Portland and buy live lobster for $2.99/lb. right on the docks or fish for stripers on the Spurwink Bridge. In 1999, I moved to Duxbury, Massachusetts, and with the exception of my recent stay in South Carolina, I have lived here ever since. By the time I reached high school, I wanted to turn my interest in the seafood industry into a profession. Although I was young and inexperienced at the time, I was lucky enough to be entering an industry always in need of hard workers. At 16, I began working at the Back River Fish Market, and I haven't looked back since. Today, I've managed a total of four fish markets along the South Shore. I can’t help but remember all of the amazing things that I have learned from the families that owned these operations. I remember how John and Cindy Payne gave me my roots in Duxbury and set the foundation. Rick Yeats at Hanover Lobster taught me how to cut fish like a boss, and Kathy showed me how to put together the best looking fish case I have ever seen. 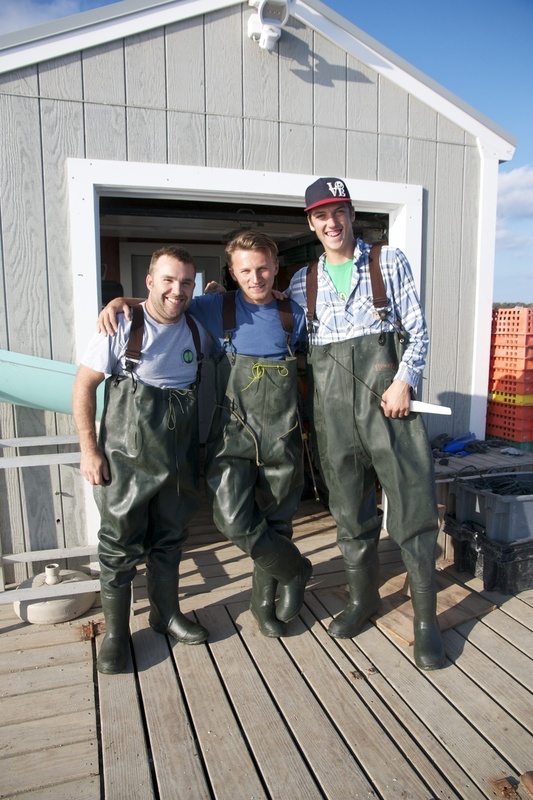 By 22, Chef Jasper White gave me the honor of controlling his first retail fish market in Hingham, while Max Harvey taught me the wholesale side of the business. On my days off, I would drive my J12 Carolina Skiff out to the flats, dig for steamers, and help my friend, Greg Morris (one of the most skilled oyster farmers in Duxbury) cultivate some of the nicest looking oysters in Duxbury. I wanted to expand my knowledge of the industry, and as a result, I moved to Charleston, South Carolina to spend the next year training under head Chef Frank McMahon. Within a few short months, Frank and the crew at Hank’s Seafood molded me into one of the top sauté cooks in the largest fine dining restaurant in Charleston. For that, I am forever grateful. While I was there, word got out that I was from Duxbury, home to some of the best oysters in the world. To prove to my chef friends in the South I wasn't all talk, I made a call to the old farm back home. The next day I had a large shipment of Duxbury Bay oysters overnighted to Charleston. The Duxburys were pulled out and placed on a plate, all within 24 hours of coming out of the water. You never truly realize how beautiful a Duxbury oyster is until you compare them to their cousins to the South (sorry guys). Soon after that, my phone started ringing off the hook. At the start it was just one restaurant looking for Duxbury oysters, then two, and then twelve. That's the moment when I decided to jump into wholesale. I first heard of Pangea Shellfish a few years back when its owner, Ben Lloyd, moved to town and purchased his oyster farm. Among the townies, myself included, it was a hot topic. Who was this new guy on the bay? I heard a few rumors of his unorthodox methods regarding his cultivation techniques, but never really dug deeper. Still in Charleston, I heard that Ben was looking for someone to manage his farm and help out with the wholesale side of the business. I knew I was the perfect guy for the job. Pangea Shellfish currently carries the largest number of seasonal varieties of oysters in the world (70 to be exact). On top of that, as a wholesale company, we sell well over 100,000 oysters a week! A week later, I made the move back to Duxbury, and I've been a part of the Pangea team ever since. In the spring and summer, I head a five-man crew here in Duxbury Bay, seven days a week. We plant our oyster seed across three acres of Duxbury Bay. We have our own custom-built upwelling system with eight silos, each containing hundreds of thousands of juvenile oyster seed. After 18-24 months they become marketable size, and we hand-select the best looking oysters to go in our Standish Shore bags. If you are a chef, fish buyer, or someone who just loves eating our oysters, stay tuned. The tides are turning, changes are happening, new ideas are spawning right here in Duxbury Bay. I will continue to do my best along with the Pangea family to bring you new updates about the oysters we love growing here, as well as introduce you to my fellow farmers across Massachusetts who have their own story to tell.